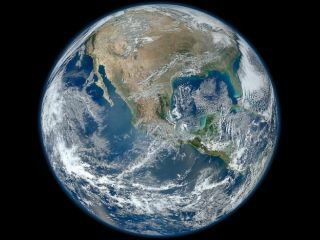 NASA is asking everybody on Earth to help create a new image of the planet composed entirely of selfies taken during Earth Day on April 22. The aim is not only to raise awareness about Earth and climate change, but also to advertise the five Earth-gazing satellites that NASA will launch this year. That's the highest launch count for the agency in more than a decade. "Designed to encourage environmental awareness and recognize the agency's ongoing work to protect our home planet, NASA's 'Global Selfie' event asks people everywhere to take a picture of themselves in their local environment," the space agency said in a statement. On Earth Day, April 22, 2014, NASA invites you to celebrate by stepping outside, taking a "selfie" and sharing it with the world on social media. The event is designed to encourage environmental awareness and recognize NASA's ongoing work to protect Earth. Taking part is simple: just bring a camera, step outside and take a picture of yourself before posting on social media. The agency will watch for photos posted to Twitter, Instagram or Google+ with the hashtag #GlobalSelfie, the Facebook event page #GlobalSelfie or the Flickr group #GlobalSelfie. While selfies have been common since mobile phones sprouted cameras, the concept exploded in popularity in March after comedian Ellen DeGeneres tweeted a selfie taken with several actors during the Oscars. The resulting tweet was the most popular ever generated, with 3.4 million retweets as of early April. The new photo will reference a full-frame picture of Earth, called the "blue marble" photo,released from NASA's Suomi NPP mission in 2012. The single image is a mosaic of several pictures taken in January that year. You can find more details on the selfie campaign through NASA.